A job interview is very significant and the impression you make there decides whether you get the job or not. In most job interviews, the candidates are scared and nervous. This prevents them from faring well in the job interview. The nervousness is mostly because of lack of preparedness or lack of guidance. While there are many aspects that matter the most important is surely presentation. A good dressing sense is thus vital to ensure that you fare well in a job interview. There are some best colours to wear to an interview, that are acceptable in a job interview. Know these and you will surely present yourself impressively in the job interview. According to a CareerBuilder’s recently published survey which was participated by around 2,099 human resource managers and hiring managers, black and blue are the best colours to wear to a job interview, while orange is the worst. Now depending on the attire, you wear for your interview, the employer would get a good first impression about you. For example, if you are applying for a management position then black color would be best, whereas blue would be the right option for showing team player skills in an interview. Your interview attire should complement your shape. Every colour creates a unique impression. That is why people try to learn about the colour psychology of each colour. There are many colours in which interview outfits are available but few that creates a truly positive impression in a job interview. So at most times, every candidate gets confused at what colour to wear to an interview. Here we have listed out a few such colours. If you ask some person who has experience in the field of recruiting or is aware of the interview practices, he will suggest you to wear white color for the job interview. This is because white is the safest colour when you are heading to a job interview. White is a subtle colour that reflects professionalism. This colour usually conveys the message that you are highly organized and reliable. In case it is your first job interview, it is better to opt for white as it is safe in most job interviews. The only drawback of white colour formal attires is that they appear stereotypical and dull to some recruiters. Especially if you are appearing for an interview for a creative job profile, they are not going to prefer stereotypical people. Another great colour that you can pick for formal job interviews is navy blue. This colour looks smart on most people. Especially people with a bit fairer complexion can confidently opt for this colour. The navy blue colour is also known to increase confidence in the wearer because of the look it creates. You have the option to choose plain navy blue shirt or go for patterns like checks and stripes. Yet, it is best to opt for plain coloured shirts for job interviews. This is because patterns sometimes erase the seriousness of the look. If the grey colour suits you, it is a great option for job interviews. It is a simple colour that is available in many different shades. If you are appearing for a job interview where they expect logical thinking from you, grey suit for interview is your best bet. Grey reveals logical or analytical thinking. It may also make you appear independent so you must know how to use independence to your benefit. Men may choose to wear formal shirts in any shade of grey. Women have multiple options in grey including grey formal skirts, grey formal trousers and grey suits. Pick a colour that suits your looks and complexion. This is a shade that is usually acceptable in job interviews. Men can opt for maroon shirts if it suits them and their complexion. These look great on formal shirts. This is also an ideal choice for women. The colour suits women of all complexions. It is known to give them a thoroughly professional look. Women have the freedom to pair maroon skirts with white or light coloured tops. Make colour choices that reflect your true personality. Avoid choice of strange colours that you are not comfortable wearing in a job interview. Blue is a magical colour when it comes to formal occasions and job interviews. Blue can be the best suit color for an interview. Blue colour is equally acceptable to male and female recruiters. You can wear light or dark shades of blue. Make a choice that suits your personality. While there are a range of colours that are widely preferred or accepted during job interviews, the converse also exists. Here we have listed out a few colours that may create a negative impression during a job interview. It is best to avoid these colours, especially during a first job interview. Black is a great colour and looks good on most people. However, this colour is known to reflect authority and confidence. Some recruiters may take it in the wrong sense and this may affect the impression you create in the job interview. So it is best to avoid this colour when you are appearing for a job interview. Red is a fabulous colour that spells romance. The flaw with this colour is that it also spells authority and aggressiveness. Most interviewers will regard you unfit for a position in the firm if you are too aggressive. So, a wise person who wants the job will avoid wearing red to an interview. Most people know the association of the green colour with jealousy and such other negative emotions. While green may not actually be a harmful colour, it is better to avoid it for interview rounds because of these negative associations. Few people approve of orange colour for job interview outfits. This is because it appears a bit too loud or gaudy. So some interviewers may regard you to lack class if you pick an orange interview attire for job interviews. 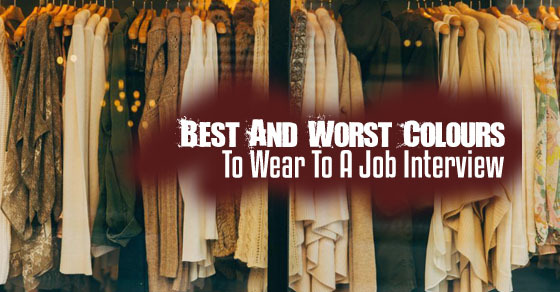 What Other Things Matter While Selecting Your Interview Outfit? While colour of the outfit is one of the major things that you consider while picking your job interview outfit, there are other things too that you need to take into account. Here we have listed a couple of such factors for your knowledge and reference. The outfit one wears for a job interview will vary with his or her gender. The formal outfit could be different for men and women. You need to wear the best formal dress for interview, keeping your gender in mind so that you do not appear inappropriate. Men can wear formal pants or trousers with a proper formal shirt. Make sure you wear your cufflinks so that you present yourself as a tidy individual. The interview tie color should have contrasting shade with some light patterns that usually goes well with the male formal attire for the interview. You need to choose a formal pair of shoes that complement your outfit. Women have the option to choose between formal skirt or trousers. In each of the above cases, they can wear formal shirts to contrast or complement the outfit. Women may choose flat shoes or heels. They must select formal footwear that matches the job interview attire. They may also wear subtle jewellery that maintains the formal look. Another thing that decides your future in a job interview is the gender of the person interviewing you. The impression caused by a certain colour or attire may be different on a man and a woman. So you need to mentally prepare yourself for the reaction of the interviewer belonging to any gender. Mental preparation is the first step to clearing a job interview properly. In the recent past, the number of openings in the creative field have increased greatly. If you are applying for a creative job, you have more options regarding clothing. These are firms or organizations, that are not very strict about their codes of dressing for an interview. You can choose funky colours like pink, orange, green, blue, yellow or a combination of all while appearing for a creative job interview. Casual attires are also acceptable to such job interviews. You must remember that as you apply for a higher position in a firm or organization, the expectations of the firm increase. If you are applying for the position of a project manager or editor, make sure your job interview dress perfectly follows the code of dressing. For higher positions, the recruiters look for people with high level of confidence and authority. Pick colours that reflect this authority. Make sure your shoes are properly polished before you head for a job interview. Wear perfectly pressed outfits for job interviews. You need to take care of your hair and set it in style so that your look and appearance creates a good impression. Women should keep the makeup to a minimum so that it does not appear too loud or gaudy. Women should avoid wearing tops or shirts with a deep neck. Such necks are known to create a negative impression during interviews. Men should make sure they have a clean-shaven face. Always put your mobile phone on vibration mode before heading for the job interview. Use deodorant to get rid of body odour. Reach the interview venue on time. Next articleWhy Older Women are Needed in the Workplace?